“Willie Davis, who succeeded Duke Snider as the center fielder for the Los Angeles Dodgers and used his blazing speed to steal 20 or more bases 11 straight years, led the National League in triples twice and set a record of three stolen bases in a World Series game, was found dead on Tuesday at his home in Burbank, Calif. 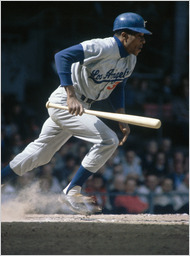 He was 69. . . .
“Frank McCourt, the owner of the Dodgers, said in a statement that Davis was ‘one of the most talented players ever to wear a Dodgers uniform.’ Davis played 14 seasons for the Dodgers, on teams that were almost immediately the stuff of legend. Among his teammates were Sandy Koufax, Don Drysdale and Maury Wills. His 31-game hitting streak in 1969 is still a team record. It was the longest streak in the majors since Dom DiMaggio’s 34 games in 1949 for the Boston Red Sox. “Davis holds six other franchise records, including hits (2,091), extra-base hits (585), at-bats (7,495), runs (1,004), triples (110) and total bases (3,094). “Davis lifetime batting average was .279, and he had a total of 398 stolen bases. He made it to the major leagues in 1960 and retired after the 1979 season. “Eric Rohmer, the French critic and filmmaker who was one of the founding figures of the internationally influential movement that became known as the French New Wave, and the director of more than 50 films for theaters and television, including the Oscar-nominated ‘My Night at Maud’s‘ (1969), died on Monday. 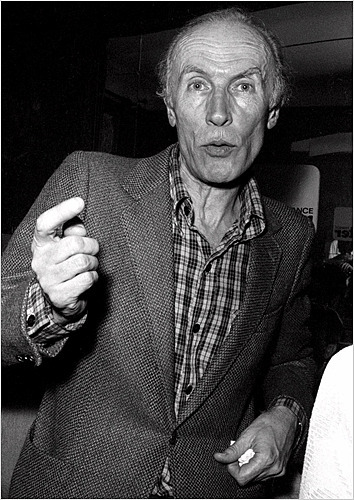 He was 89. . . .
“Aesthetically, Mr. Rohmer was perhaps the most conservative member of the group of aggressive young critics who purveyed their writings for publications like Arts and Les Cahiers du Cinéma into careers as filmmakers beginning in the late 1950s. A former novelist and teacher of French and German literature, Mr. Rohmer emphasized the spoken and written word in his films at a time when tastes — thanks in no small part to his own pioneering writing on Alfred Hitchcock and Howard Hawks — had begun to shift from literary adaptations to genre films grounded in strong visual styles. 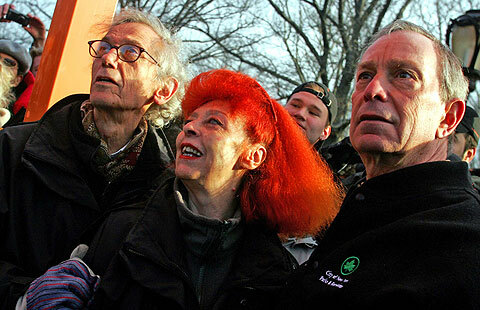 “Jeanne-Claude, who collaborated with her husband, Christo, on dozens of environmental arts projects, notably the wrapping of the Pont Neuf in Paris and the Reichstag in Berlin, and the installation of 7,503 vinyl gates with saffron-colored nylon panels in Central Park, died Thursday in Manhattan, where she lived. She was 74. “The cause was complications of a brain aneurysm, her family told The Associated Press. “Jeanne-Claude met her husband, Christo Javacheff, in Paris in 1958. At the time, Christo, a Bulgarian refugee, was already wrapping small objects. Three years later, they collaborated on their first work, a temporary installation on the Cologne docks that consisted of oil drums and rolls of industrial paper wrapped in tarpaulin. “Claude Lévi-Strauss, the French anthropologist who transformed Western understanding of what was once called ‘primitive man’ and who towered over the French intellectual scene in the 1960s and ’70s, has died at 100. . . .
“A powerful thinker, Mr. Lévi-Strauss was an avatar of ‘structuralism,’ a school of thought in which universal ‘structures’ were believed to underlie all human activity, giving shape to seemingly disparate cultures and creations. His work was a profound influence even on his critics, of whom there were many. There has been no comparable successor to him in France. And his writing — a mixture of the pedantic and the poetic, full of daring juxtapositions, intricate argument and elaborate metaphors — resembles little that had come before in anthropology. . . .
“A descendant of a distinguished French-Jewish artistic family, Mr. Lévi-Strauss was a quintessential French intellectual, as comfortable in the public sphere as in the academy. He taught at universities in Paris, New York and São Paulo and also worked for the United Nations and the French government. “Soupy Sales, whose zany television routines turned the smashing of a pie to the face into a madcap art form, died Thursday night. He was 83. “Mr. Sales’s former manager, Dave Usher, said the entertainer died in a hospice in New York City after suffering from multiple health problems. 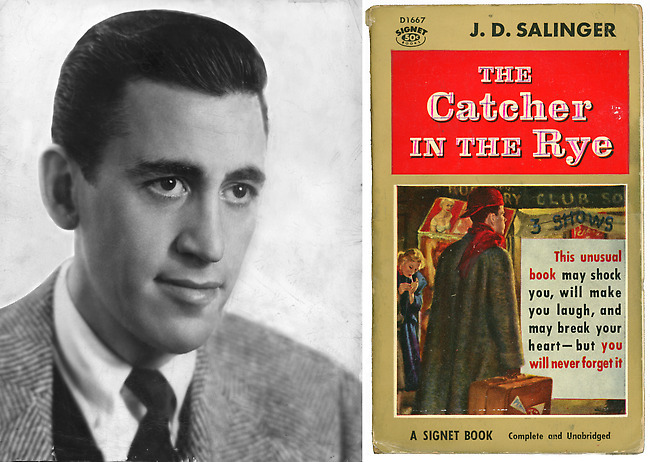 “Cavorting with his puppet sidekicks White Fang, Black Tooth, Pookie the Lion and Hobart and Reba, the heads in the pot-bellied stove, transforming himself into the private detective Philo Kvetch, and playing host to the ever-present ‘nut at the door,’ Soupy Sales became a television favorite of youngsters and an anarchic comedy hero for teenagers and college students.